Nearly every discussion of mobile content consumption references the benefits of collecting data. Knowing the specific metrics to track, however, and how these numbers might improve long-standing company goals is a less-talked about idea that needs to be visited in order to maximize the benefits of a mobile app. Continue reading for an overview of the important big-picture metrics related to mobile app usage and how each number reflects on a company’s bottom line. Advances in technology means business owners and leaders of organizations are able to track the types of individuals consuming their content online. Much like website analytics, mobile app statistics offers insight into demographic information such as age and location. Marketing messages and strategies for how to find leads may very well change based on an audience’s makeup; consider diving into demographic information to achieve a better understanding of who is consuming content. Download numbers are often the most talked-about metric, but simply knowing how many people downloaded an app isn’t taking the data analysis far enough to set real milestones and keep momentum moving forward. Track downloads on a month to month basis and notice correlations between spikes in numbers and promoting new content in the app or other actions that might help to hone in on the best content marketing strategy. Is your mobile app a one-hit wonder or do users keep returning to consume content in subsequent weeks? High download numbers don’t tell the entire story; track retention analytics to ensure the mobile app is providing lasting value to users. Converting users to leads or customers typically requires more than a quick 30-seconds in the app. Work to nurture existing users and prove the app’s value as soon as possible to first-time downloaders. Retention numbers can be boosted by providing evergreen and valuable content like PDF documents showcasing key or exclusive industry insights. Learn more. Are users engaging with social media functions in the mobile app or loving the user feedback feature? Dive into engagement metrics to determine how to best communicate with users. Another example is push alerts: are users interactings with the deep link provided in the notification? If numbers vary by push alert, consider how the messages vary in wording or timing. Understanding engagement gives app owners the ability to focus future efforts on the most successful strategies. Track individual user’s activity in the app to understand if their path from point A to point B is ideal. In other words, is the most vital content accessible from the homepage and are visual queues to perform everything from a contact form inquiry to downloading a PDF performing as expected? Make changes where necessary and ensure users are funneled to the most important content within the first few minutes of interacting with the mobile app. 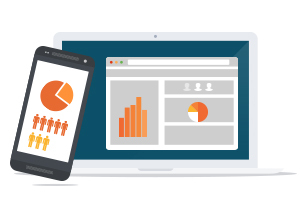 Did you know AppBurst apps offer a full suite of detailed usage analytics? Read more. Keep your mobile app developer honest by routinely reviewing crash reports. Are iOS devices greatly outperforming Android in terms of reliability? Schedule a phone call with your developer to discuss concerns and ensure the app is performing for each and every user. Crash reports, along with A/B testing, provide the best overview of the actual experience and can be combined to make structural changes to the app in the best interests of end users.